We are taking this month to give thanks for our blessings. 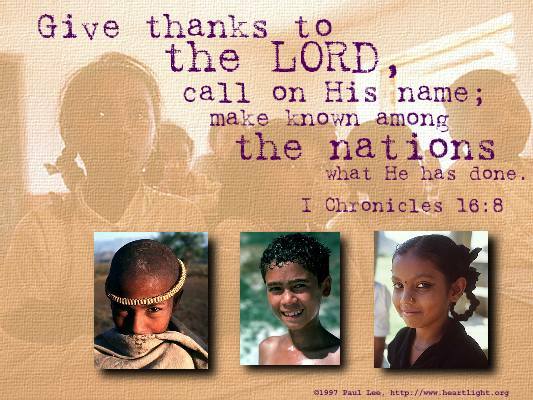 We want you to know that that at Heartlight.org and VerseoftheDay.com we are thankful for you! We are specifically thanking God this week for your financial support. Your gifts and donations have enabled us to reach hundreds of thousands of people each month around the world in 8 languages. We have promised not to bombard you with donation requests and you have been generous over the 16 years Heartlight.org and VerseoftheDay.com have been available online. During this season of giving thanks, we really appreciate you considering a donation to help us. During this last year, we've added 5 languages to our VerseoftheDay.com resources. In addition, we've released Heartlight.org apps for iPhone, iPad, and Android mobile devices, and revised our heartlight.mobi website to make it fast and very useable across a wide variety of devices. In 2013, we are planning to develop a VerseoftheDay.com mobile site and and release apps for it as well. Why don't you put more ads on your pages? I live outside the US ... how can I donate? Do you accept support from churches?